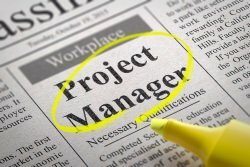 Do you know what steps can you take to become a Project Manager when you don't have any experience? The approach I recommend is to use your current job as a launch pad to get your first project management assignment. When you first start thinking about becoming a Project Manager, your first priority is to excel in your current role. Doing this will demonstrate that you are ready to take on the additional responsibility of leading a project. To be a rockstar in your current role, you first need to know what is expected of you in that role. Your goal is to exceed those expectations. Start by making sure you understand how your role is defined. At a minimum, you need to make sure you are able to fulfill these requirements. Make sure you include informal requirements that may not be part of your "official" job description. Once you understand the role requirements, you want to make sure that you are clear on what the successful accomplishment of each of those requirements looks like. How does this need to be done? Now that you understand what is expected, the next step is to use a systematic approach to ensure you exceed these requirements day-in and day-out. Using a two-step planning process, you can make sure that every job requirement is fulfilled and, at the same time, become the most effective and productive person on your team. Every Sunday, identify the key deliverables you need to complete and any meetings you need to prepare for during the upcoming week. Create an Action Plan for each of these items that specifies what you need to do and when it needs to be done. Every night, create a plan for the next day. Review the Action Plans you created during your weekly planning session and schedule time for any actions that need to be completed the next day. The key is to be proactive instead of reactive. Understanding what is expected of you in your current role and then taking a proactive approach to planning your week and your day will enable you to ROCK your current role. Take a look at The Reputation Turbo Charger if you'd like more ideas on what you can do starting today to ROCK your current role while preparing to become a Project Manager. The second aspect you need to focus on to become a Project Manager is your leadership capacity. Leadership is the art of motivating and leading a group of people to accomplish a goal. However, there are specific actions you need to take with yourself before you are ready to lead others, and this is where you should focus your attention for now. "No man is fit to command another that cannot command himself." You can develop your leadership capacity by having a leader’s mindset and working on your command presence. Your mindset is the way you think about the world. It will determine how you see and approach the tasks and activities you are involved in. You want to develop a mindset that will enable you to be an effective leader. Ownership means that you accept responsibility and accountability for the outcome of a task. Taking ownership of any task assigned to you is critical. In practice, this means you are committed to completing the task successfully. This may mean working extra hours, finding creative solutions to problems that come up, and basically being willing to do whatever it takes, within legal and ethical boundaries, to make the task successful. Owning a task means that you will take the initiative for any actions needed to complete it. You will be proactive about finding solutions to any issues that come up. You won’t take a wait-and-see approach, but will drive issues to resolution. It demonstrates that you are results-oriented. A sense of ownership is one of the most important internal traits of a successful Project Manager. To lead means to show the way. And to be an effective leader, you must have the self-discipline to lead by example. You need to have the self-discipline to model the behavior you expect from your project team and other stakeholders. Consider the actions you consider important for the success of the project, then commit to ensuring that you set the example that you expect from others. You must demand this level of self-discipline from yourself before you can expect it from others. Your attitude will determine the way you approach an assigned task. When a challenging tasks lands on your desk, it is important to approach it with a positive mental attitude. By framing a challenging task in a positive way, you will be able to achieve what others consider impossible. Instead of asking, "Why can’t this task be done? ", frame the task in a positive way by asking, "What is it going to take to successfully complete this task?" This simple change in attitude will enable you to find solutions where others see nothing but roadblocks. Command presence is the way a leader presents himself to others. People will notice your command presence before anything else. It is the basis of the first impression you make on others. Within 5 seconds of seeing you for the first time, people will develop their first impression about you. The first thing they will notice about you is how you look. The way you look sends a very strong non-verbal message to others. In general, you want to present yourself in a professional manner. This includes both the way you dress and the way you groom yourself. Once you have your appearance nailed down, the next thing people will notice is the way you carry yourself. The key here is that you want to appear confident. You do this through your body language. Your goal at this stage is to exceed expectations for your role. You want to make sure your actions reflect this goal. People will see what you do, so make sure your actions build up your image and don’t tarnish it. The actions you take should show you are a dependable and reliable person that others can count on and trust. What you say, when you say it, and how you say it all affect how others perceive you. How you speak can strengthen their confidence in you or weaken it. Avoid the use of discounting phrases like "I think..." and "I hope..."
Communication is at the heart of project management. You won’t be able to lead effectively if you can’t communicate well, so put some thought into how you speak. The third aspect you need to focus on to become a Project Manager is building your project manager skills. These are the specific technical skills that Project Managers have developed to help them complete projects successfully. As you can see, there is quite a bit of information that you will need to learn to be a successful Project Manager. To make this manageable, I recommend a Learn-and-Apply approach. Over time, this approach will ensure you have the project management skills you need to lead your projects successfully. When you are first learning about project management, it is important to get an overall understanding of what is involved in leading a project. You want to get exposure to the full project management life cycle. Start by taking a Project Management 101 course. This will provide you with a structured overview of leading a project from start to finish. You should also get a good reference book to complement the course. I recommend "Project Planning, Scheduling, and Control: The Ultimate Hands-On Guide to Bringing Project in On Time and On Budget" by James P. Lewis. Once you have a good grounding in the overall project management life cycle, skills, and processes, you should start to broaden your exposure to the profession. The best way to do this is to join the Project Management Institute (PMI). When you join the PMI, you will have access to PM Network. PM Network is the PMI’s flagship publication for professional project managers. By reading this magazine, you will start to see how project management is used across industries and across the globe. In addition, by being a PMI member, you will also be able to participate in networking events with professional Project Managers. Not only will you be able to learn from the first-hand experience of professional Project Managers, but one of them may have the perfect opportunity for you to get your foot in the door and become a project manager. To really build your project management skills you will need to apply what you are learning about project management to your day-to-day job. Start by determining how your current organization implements project management and how your current role fits into that organization. If your organization uses projects or if your current role is part of a project, look for opportunities to apply what you are learning to your work. Even if your organization doesn’t use projects, you can still apply what you learn by treating your assignments as mini-projects. Start to use the knowledge you have gained to rock those assignments. You can also look at how you can expand your current role to take on more project-related responsibilities. If you are part of a project organization, see what other aspects of projects you can help with. If your organization doesn’t use formal project management techniques, you may be able to lead your team in that direction. This 3-step approach can help you use your current role to transition into a project management career. If you take these actions you will be on your way to become a Project Manager. Do You Want More Project Management Tips? Subscribe to Project Success Tips, my FREE Project Management Newsletter where I share tips and techniques that you can use to get your Project Management Career off to a great start. As a BONUS for signing up, you'll receive access to my Subscribers Only Download Page! 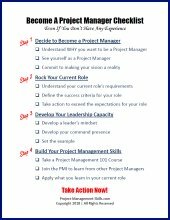 This is where you can download my "Become A Project Manager Checklist" and other project management templates.